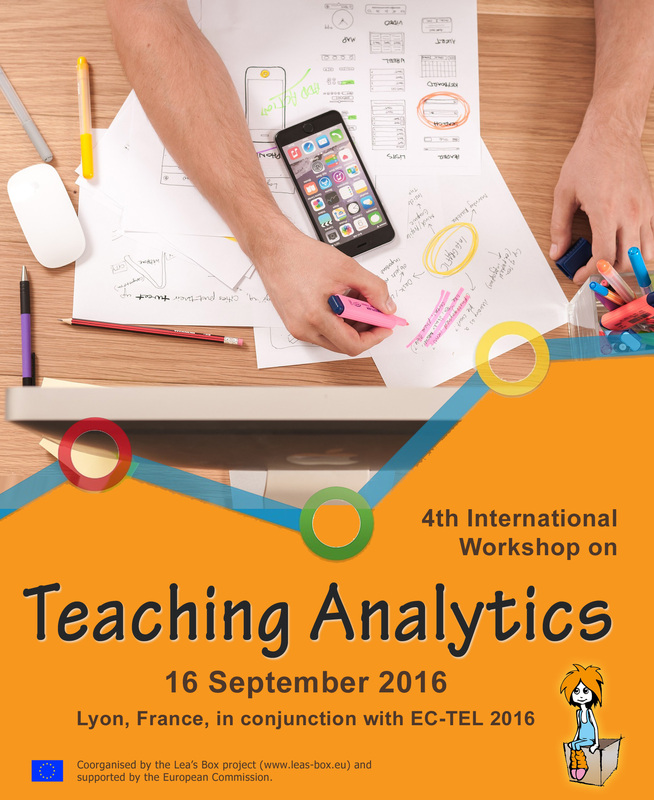 As opposed to the focus of the workshop at LAK'16, this workshop emphasized the importance of tailoring learning analytics to the needs of teachers and the aspect of improving teaching by analytics. Details and the proceedings booklet are available here. In the context of LAK'17 in Edinburgh, UK, Lea's Box organized a workshop that aimed at emphasizing the opening and communicating of learnign analytcis results to the actual learners. Details and the proceedings booklet are available here. The Lea's Box project was organizing a Learning Analytics Summer Camp in Prague on 31 July 2015. The summer camp is based on an in-depth presentation of the projects and research directions and the search for a common ground and alignment of common strengths. This event is not so much a mere exchange of knowledge and solutions, but much more a joint effort to bring all that we have in the pockets to a concrete and broad application in the European educational landscape. Essentially, the major aim of the summer camp is to find joint solutions to the ‘impact’ we are expected to make. We believe that streamlining our expertise and already existing solutions can bring us a big leap forward. This is not trivial however, since it requires a team that is big enough to comprise major knowledge and a team that is small enough to be able to really accomplish our ambitious, but so important goal. Together we can form a team that is strong enough to accomplish this. Check out the workshop website with the results of the workshop! Joint workshop of the GALA Network of Excellence and the LEA’s BOX project at EC-TEL 2014, September 17, 2014, Graz, Austria. 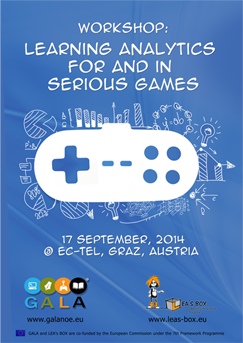 Topic is to present and discuss approaches to improve serious games by techniques of learning analytics and educational data mining. Details and the proceedings booklet are available here. The final report summarizes all project activities and achievements over the entire project duration. This report is particularly interesting since it elaborates on how Lea’s Box advanced the state of the art in learning analytics. In this public version of the report, specific management-related and confidential pages have been removed. Deliverables 5.8 present the workshops and other activities conducted in the light of providing end users with training and information about the solutions of the project. Training and dissemination activities, being not isolated from all the other project´s activities, are closely connected to all other forms of interactions with end-users, be it piloting and evaluation, co designing, advisory, or exploitation. In the course of the project we undertook numerous activities in the partner countries Austria, the Czech Republic, Turkey, and the UK. This report is the final collection of the results of evaluation studies and experiences from pilot studies within the project. The deliverable summarizes the results and insights and provides the evidence for the validity and suitability of the Lea’s Box solutions. The main objective of piloting and evaluation activities was to use the Lea’s Box system and its components in real schools, to evaluate key aspects of the system and subsequently to modify the tools based on the feedback received. Earlier deliverables from work package 5 were very practically oriented, for example D5,4 presented different educational scenarios and classroom issues, while D5.5, described specific tools offer by the Lea’s Box system. Based on the feedback from received in year 1 and 2, the final release of the system was shaped and the integration of its individual components was considerably improved. This deliverable thus presents the main results of piloting and evaluation studies related to the whole Lea’s Box system. All test instruments and questionnaires are available as zip archive (10 MB). In M31 of the project, i.e., September 2016, w released the final release of the system. This release is a fully integrated version of the main interface, processing, analytics, and visualization features, including the open learner modelling (OLM) system. The document bundle includes a technical description and manuals of the sub-components. Please note that the Lea’s Box system will be developed and advanced beyond the project and beyond the final deliverable in order to exploit the project results. This document bundle includes not only D2.6, the actual system release report, but also deliverable D3.4, third release of LA/EDM services and algorithms as well as deliverable D4.5, the final release of visualisation and OLM web services and tools. This is the link to Lea's Portal. For access credentials please contact us! LEA’s BOX contains a multitude of tools, enabled by a central executive to carry out multi-source, competency based learning analytics. Competency maps can be introduced using FCA and competency states can be calculated using CbKST, based on the evidences from received data. The tools use this capability to support a large set of pedagogical scenarios, including but not limited to formative assessment, self-evaluation, personalized course planning, and tracking. This report details a plan on the exploitation of the project outcomes. . Deliverable 5.5 presents the second stage of piloting of the LEA’s Box tools. Piloting is one of the most important parts of the LEA’ Box project: after all, no matter how successful research results may seem, it is always crucial to try out the tools and applications developed “in a lab” in the real world. This deliverable is a continuation of D5.3, which was very practically oriented, unlike deliverables D5.1, which focused on the piloting methodology, D5.2, which proposed activities for pilot studies, and D5.4, which described different scenarios and classroom issues. Deliverable D5.3 described several pilot activities and tools, such as the myClass tool or the mind mapping tool. In the meantime, the tools developed within the project were substantially improved, new tools were built on the existing ones and new use-cases were proposed and tested. These activities were preceded by a thorough evaluation of the feedback generated during the first phase of piloting. Therefore, this deliverable describes new extensions of the LEA’s Box tools and new use cases and explains what changes have been made and why, i.e. what steps we took in order to reflect teachers’ and students’ needs in the best possible way. In the very heart of WP2 is the design and development of a Learning Analytics web portal. Based on the requirements specification document, the focus groups and design studies, we designed, planned, and developed this platform and have a second, completely revsied release in December 2015. The platform itself consists of various tools and underlying algorithms. The corresponding deliverables are listed in the box on the left. Along with the basic system we released also the second versopn of the CbKST/FCA-based Learning Analytics services as well as visualiztation and OLM tools. Visualizing partly very complex information is one of the key pillars of learning analytics. However, finding the rights techniques to make users (teachers, students, parents, ...) understand what they should understand is not an easy task. Lea's Box invests in a broad spectrum of research and development to identify the right solutions. This report covers the research in visual analytics more generally, to situate the work on learning visualisations. We then consider learning analytics portals and dashboards, which most commonly visualise activity, performance or interaction data. We end by looking at open learner models, which typically show visualisations of competencies, understanding or skills, based on inferences about learning rather than the raw countable data. In between we consider other kinds of educational data visualisation, that are nether activity counts nor inferences about knowledge, but rather, ways of using students’ products to generate some information about their learning. This could be viewed as intermediate between the other types of data that are visualised. Our main concerns in LEA’s Box are with learning analytics visualisations and open learner models. It will be seen that the former, mostly numerically-based data, more often tends to be presented as the familiar graphs, charts, plots, etc., while the latter, usually knowledge or skill-based information has a lower tendency to use these standard methods of conveying data, instead using a variety of simple and complex, sometimes structured, visualisations. This Deliverable provides an overview of some of the similarities and differences within and across types of learning visualisation, with a need for further evaluation of the relative utility of different visualisations during the remainder of the project. Piloting at schools is a vital part of the LEA’s Box project as it enables us to verify the functionality of the tools, their user-friendliness and comprehensibility. The previous deliverables focused on the description of the theoretical framework of piloting: D5.1 contained a plan of the piloting methodology, D5.4 focused on different scenarios at schools and on problems faced by current teachers, and D5.2 suggested particular steps and activities that were going to be done during the pilot studies. All these deliverables served as a background for planning the piloting activities, the outcomes of which will now be summarized. The piloting included creating virtual classrooms, working with mind maps, observing students doing different activities and assessing their performance and behaviour. Feedback from teachers was gathered from online survey and focus groups held in the Czech Republic, Turkey and Austria. This report will contain some relevant information concerning the current situation at schools and a summary of teachers’ experience with LEA’s BOX. The purpose of this document is to review the state of the art in the field of learning styles (LS) and to extract the “quintessence” of this wide-spread and diverse research area which offers a huge amount of models and theories. To extract this quintessence of the learning styles literature, existing models and theories which have been considered as important and representative for the whole LS research field have been identified, selected and described. The Formal Concept Analysis (FCA) has been applied formally describe and to cluster the learning styles suggested by the selected models and theories. The FCA took 70 learning styles as objects and 48 attributes (properties of learning resources, learning activities, etc.) into account. Aiming for a non-invasive approach to measure a learner´s dominant learning style, a Competencebased Knowledge Space Theory (CbKST)- assessment procedure has been outlined. Afterwards, an excursus on the so-called “matching-hypothesis” is given. The matching-hypothesis suggests that the instructional style or the nature of the learning resources to be consumed (e.g. “concrete” or “visual”) should be aligned with the learner´s dominant learning style. Finally, we will conclude and outline future steps on research and development activities in LEA´s BOX related to learning styles. Based on the review provided by this deliverable, conceptual research on the LS approach will continue and will be translated into the implementation of a set of analytics and data mining services and their integration in the LEA’s BOX platform. In the very heart of WP2 is the design and development of a Learning Analytics web portal. Based on the requirements specification document, the focus groups and design studies, we designed, planned, and developed such platform and have a first release at the end of year 1. This web platform, of course, is a first initial step and will be filled with contents and not least users subsequently. The design and functionality mirrors all the experiences and demands of teachers that were involved in the studies. Basically, the key requirements are simplicity and individual design. Therefore, we do not offer a monolithic powerful tool, but a simple approach with many different tools that not necessarily haven even the same look and feel. Instead of a “Microsoft Word” we developed and released a number of “Text Editors” and individual “Apps”. The platform itself consists of various tools and underlying algorithms. The corresponding deliverables are listed in the box on the left. A general awareness of the importance and significance of data protection is also reflected in national and international laws and directives, where data protection is usually considered as a fundamental right. An overview on national regulations in Czech Republic, Turkey, Austria, and the United Kingdom, where LEA’s BOX is carrying out pilot and evaluation studies and collecting and processing personal data. In addition, the European data protection regulations are summarized, which mainly aim in establishing common rules for data protection in member states and keeping a balance between a high level of protection of individual privacy and the movement of personal data within the European Union. In this document, a summary of the different categories and sources of data is given and types of indicators used for LA are presented. The analytics methodologies employed in a concrete LA project depend on the kind of data collected, as well as on the target stakeholder group(s) and their objectives. The most common methods that are used to extract meaningful patterns from educational data are presented in this document. An increasing number of tools exist that implement these methods and provide support in pre-processing, analysing, and visualising data. A systematic overview of different categories of tools and their main purposes and characteristics is given and examples of each type are provided. This is complemented by a summary of the most recent trends in LA technologies. Game-based learning and virtual worlds are emerging technologies that are acknowledged for its positive impact on learners. The application of LA in these research areas constitutes another trend in the field of LA and is summarised as an excursus section in this deliverable. Although much progress has been achieved in LA in the last years, there are still a number of great challenges to be addressed in future research. The existing research and practice gap is probably the most pressing one, which is related to a set of more specific challenges, including data integration from different sources and the implementation of meaningful and intuitive tools for teachers and learners. In addition, there is an urgent need for convincing empirical evidence on the positive impact and added value of LA for learning and teaching, to foster acceptance and adoption of LA technologies in educational practice. Briefly summarized, teachers prefer using digital devices as a productive tool in their classrooms. Individual data from students comes not from learning applications but from classroom micromanagement led by teachers. Because of lack of accessible tools for formative assessment teachers are mostly focused on summative assessment. Teachers have a need for tools for learning analytics and formative assessment but they must be very easily manageable and time efficient. Based on experience it will be very hard to implement formative assessment tools to the classroom with typical frontal teaching strategy. More suitable for formative assessment approach is project-based learning where a teacher can work as a facilitator and a mentor. In this scenario the teacher has more time for micro-management and micro-assessment (in our case the teacher is gathering and creating data for follow-up analysis. The most preferred visualizations of student progress were Hasse diagrams and Radar charts. One thing however, is clear, as a large scale survey with over 2000 responses show: A wide majority of teachers acknowledge and appreciate the potential value of learning analytics tools to support a formatively inspired assessment and teaching. Only the tools must be available and suit the classroom reality. Systems such as TU Graz’ myClass or SEBIT’s Vitamin platform may provide clear advantages! Further useful information about the uptake of technology and its context conditions in Europe can be found on the European Commission Digital Agenda website; a similar report for the US is provided by PewResearch. For the detailed results of our studies, you may download the full document.